This relief of the Pharaoh Akhenaten and his family is frequently called the first (surviving) domestic scene in art. Akhenaten, born Amenhotep IV, is one of the most famous and unusual Pharaohs of Ancient Egypt. Akhenaten is often considered the first monotheist in history, abandoning the traditional Egyptian pantheon, and instituting sole worship of the Aten, the manifestation of the sun, originally one of the aspects of Ra. Some scholars consider this Atenism the foundation of the monotheism of Judaism. The period of Aten's supremacy was relatively short; it lasted about twenty years in what is known as the Amarna period, and traditional religion was restored not long after Akhenaten's death at the end of a seventeen year reign. In terms of visual art, Akhenaten completely changed the way Pharaohs were depicted. Abandoning the traditional depiction of Egyptian kings, Akhenaten's official images look completely different. He is shown with an elongated face and more delicate features; he has thin arms, legs, and chest, wide hips, and a prominent stomach. This has led to a variety of medical diagnoses in modern times, with some speculating that he was transgendered. We can see the same basic body shapes in this relief, and the elongated heads of the children are particularly prominent. Considering that most depictions of Pharaohs incorporate little or no personal differentiation, it is just as likely that these odd portraits were purely stylistic. The issue of Akhenaten's appearance remains a very large mystery of Egyptology. However, even aside from the figures' unusual appearance, this relief of Akhenaten and his family is extremely interesting. We see the family in worship of Aten (extending ankhs toward the royal family at the ends of the rays). It is extremely unusual to see such a simple and earthly scene of a Pharaoh, who were usually regarded as gods. It is interesting that Akhenaten placed his family in such prominence. 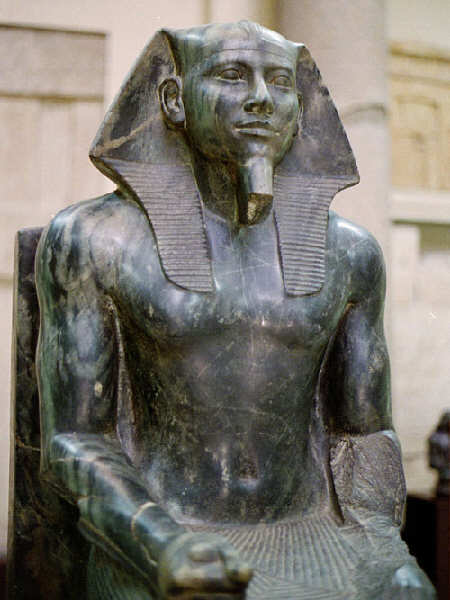 Today, two members of his family surpass him in fame; his wife, Nefertiti is especially well known due to her famous bust, and their son was Tutankhamen. There is something inherently sweet about this family scene. We see the children climbing on their parents, and there is an intimacy that comes through more than three thousand years later. These are bizarre looking creatures. The children resemble aliens with elongated skulls, strange facial features and extra long necks. Their belly buttons are in a strange location as well. The parents do not have the elongated backward skulls even though perhaps their skulls elongate upwards under their headdress. They are all quite strange in appearance and leave more questions than answers.